From January 16 – 24, Royal Cliff Hotels Group was the venue of choice for the Orbit Group’s gathering of 403 top sales agents and sales personnel, making it one of the largest Russian MICE incentive groups in Thailand. Delegates came from different parts of Russia, and for many, this was their first trip to Thailand. 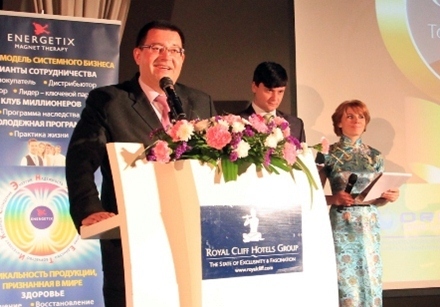 Royal Cliff Hotels Group’s Director of Sales & Marketing Victor Kriventsov welcomed the group on behalf of the Russian Federation Consulate to Royal Cliff and Pattaya. Royal Cliff Director of Sales & Marketing Victor Kriventsov welcomes the Orbit Group to the Royal Cliff during their meeting in the Grand Hotel. The purpose of this assembly was two-fold. Orbit Group presented the top sales people with awards for their exemplary achievements and continuous hard-work. The company also introduced a new line of products, such as utensils, fitness, and healthcare products. Furthermore, Orbit Group arranged a show in Grand Hotel’s Royal Summit Chamber, to model the newest products from Energetix, one of the brands under Orbit Group. Energetix is a jewelry brand for men, woman and children.